Even for the greatest of artists, inspiration has to come from somewhere. In terms of mythology, this inspiration was often attributed to a divine source, personified by an inspirational entity or being such as a Muse. In Ancient Greece this idea was developed in more detail, where specific gods and goddesses were assigned as patrons for particular artforms. William-Adolphe Bouguereau's Art & Literature(1872), illustrated the common symbolism associated with these two art forms. Literature holds a Scroll and Lyre. Art holds a pencil and drawing surface. These symbols were in accordance with those described in Emblem Books. By the time of the Renaissance, these ideas had crystallised to the extent that art scholars began to compile Emblem Books, which guided Artists on how to depict a range of ideas and emotions. The most well known of these is Cesare Ripa's Iconologia (pub.1593), which collected emblems from Egyptian, Greek and Roman antiquity and presented them in a handy guidebook. Later editions were illustrated, and are still used to this day by a range of creative artists. Description of the Art Emblem from a 17th Century illustrated translation of the Ripa's Iconologia. The initial publication of this book in 1593 did not contain illustrations. Looking at artists that are shining examples of creativity, contemplation of how they arrived at their distinctive style is an interesting journey. More often than not, the seeds of inspiration will be found in past sensory and life experiences, sometimes even direct exposure to the art of a previous artist or era. Raffaello Sanzio of Urbino(1483-1520), known to most of us simply as Raphael, is considered one of the most sublime talents of the Renaissance. In his relatively short life, he displayed an amazing ability to analyse, adapt and improve upon his own range of skills. Starting as an apprentice in his father's studio, Raphael's earlier works are quite derivative of his fathers almost 2 dimensional style. >The Virgin and Child , painted c.1488 by Raphael's father Giovanni Santi. This subject was to be an enduring favourite of Raphael's. This painting is currently on display at the National Gallery, London. Despite his fathers early influence, Raphael was orphaned by age 11, and spent time between the care of his uncle and stepmother. Owing to his precocious talent, it was decided that a suitable master be sought to develop the skills of the young artist. The first of these was Pietro Perugino(1446-1524), a well established artist who worked primarily around Perugia and Florence. Raphael began his apprenticeship at a young age(though there is debate as to when this commenced). By age 17, he was accredited 'Master' status, denoting that he was considered a fully qualified painter. Innovative elements of Perugino's style, such as the depiction of landscapes and carefully posed figures began to surface in Raphael's work. Biographer Giorgio Vasari (whom we are told by scholars is not an entirely infallible source), states that in some works, the extent of the young Raphael's emulation of Perugino's style is so complete that it would be difficult to tell certain works apart. There are many influences where Perugino's influence in Raphael's works are quite plain to see, one of the most notable of these being Raphael's 1504 The Marriage of The Virgin (currently housed at the Pinacoteca di Brera in Milan) - and Perugino's work painted between 1500-1504 - which can be seen at the Musee de Beaux-Arts in Caen, France. It must be noted with some astonishment that Perugino was 58 years of age when his version was completed, whereas Raphael was 21. 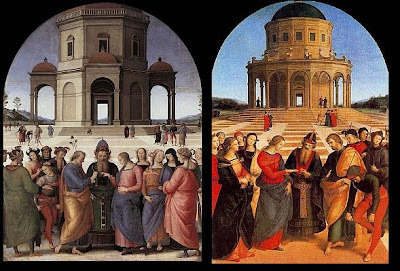 Perugino's 'Marriage of The Virgin' (Left) compared to Raphael's (Right). Perugino's fondness for placing classically inspired architecture in landscapes and backgrounds had a strong effect on the young Raphael. Believing he had learnt everything he could from Perugino, Raphael set out to learn from the two greatest artists of the time, Michelangelo Buonarotti and Leonardo Da Vinci. In Florence, Raphael made many sketches of these great artists works, some of which still survive today, and indicate how these older masters works were affecting Raphael. From Leonardo, Raphael can be seen to absorbing lessons on the posing of his figures. In Da Vinci's Leda and The Swan, we can see Raphael's focus on the contrapposto pose of the central figure. The elevated hip and accompanying tilt of the shoulders adds a sensuality to the figure, accentuating the anatomy or the chest and hips. This technique is a wonderful example of the fondness of Renaissance artists for styles from Antiquity. 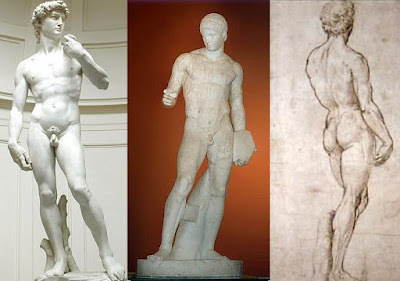 The contrapposto style was evident from Ancient Greek sculpture, and was most famously used in Michelangelo's David. To master this technique, Raphael made numerous sketches of life models posed in the same manner. Raphael's experiences in Florence gave him a new insight into posing figures, which was to become stunningly evident in his next phase of work when he travelled to Rome towards the end of 1508. Whilst in Rome, Raphael took the opportunity to learn more from the 'Beautiful forms' of Antiquity. It is interesting to note that in about 1480, a young man walking along a hillside not far from the Colosseum fell into a previously unknown subterranean space when the ground below him gave way. To his amazement, and the subsequent elation of Artists and Historians alike - it was discovered that the grotto was the subterranean remains of Emperor Nero's Domus Aureus(Golden House), buried beneath later Roman construction after the suicide of the infamous Emperor. Vasari describes both Raphael and Michelangelo eagerly making their way down, and via torchlight discovering the lavish painted decorations and sculptures that were contained within. Nero(37-68CE) is most famous perhaps for his apparent lunacy(described by later chroniclers such as Suetonius - Lives of The Caesars (Nero), and also depicted by both Shakespeare(Henry VI) and Hollywood(Quo Vadis) as reveling in the Great Fire of Rome in July 64CE. Historians now believe Nero was not in Rome during the outbreak of the fire, but did use the fire as an opportunity to rebuild Rome according to his whims. Although the public cannot see the Raphael Loggia at the Vatican, a near-exact replica can be viewed at the Hermitage Museum in St Petersburg, Russia, which was ordered by Catherine II(1729-1796). For more detail on this amazing fusion of classical and Renaissance styles, Nicole Dacos The Loggia of Raphael: A Vatican Art Treasure(pub. 2008) is a stunningly detailed exploration of this very unique work. It is commonly held that Raphael reached the peak of his powers during his Roman period, where he worked for 12 years, until his untimely death at age 37 in 1520. The art produced by Raphael during this phase has divided the public and Art community alike. Some see his work as nearing perfection, and representing the very essence of the Renaissance. This is indeed demonstrated in Raphael's dedication to the beauty of classical art, evidenced from even his Perugino inspired early paintings which included allusions to classical architecture. Raphael's seeming obsession with Antiquity is no better displayed by his choice of final resting place, The Pantheon. This is the most well preserved of Roman Temples, initially converted to a Church and then a Mausoleum - where it is reported that Raphael paid for his burial plot himself. 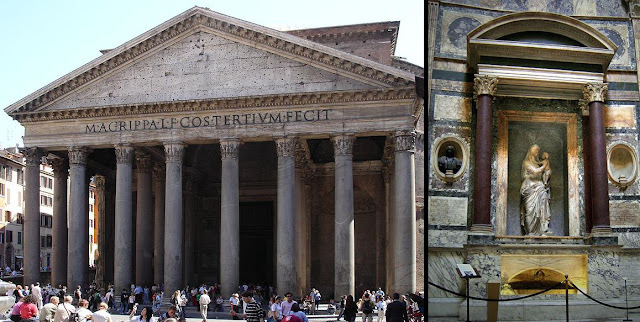 There is simply no better remnant of Roman Architecture, and a somewhat fitting place for Raphael's bones to rest in. The epitaph at the tomb reads veterum aemulus or disciple of the ancients. It was in Rome where Raphael created his most famous work - The School of Athens. Like the Mona Lisa and the Sistine Chapel, this image has become emblematic of the Renaissance. Unlike these images though, Pre-Christian figures are at the very centre, illustrating clearly the fondness for classically inspired humanist thinking which typified the Renaissance. It is essential to be aware that this image was painted in what was to be the Pope's Julius II private library(the Bibiloteca Iulia). The work is actually labeled Causarum Cognitio(Knowledge of Causes) and includes a decent sample of what was considered to be a 'who's who' of knowledge, and the creative arts. 'The School of Athens' was a moniker which first appeared in a 17th guidebook, and is now the popular name of this work. It is natural to query why the Pope would permit images of the most prominent of (Pagan) Pre-Christian figures to adorn his Study. Rather than saying it illustrates the struggle between Science and Spirituality, it is equally as likely to have been acceptable simply because images of the greatest minds of all time are a fitting decoration to a library. 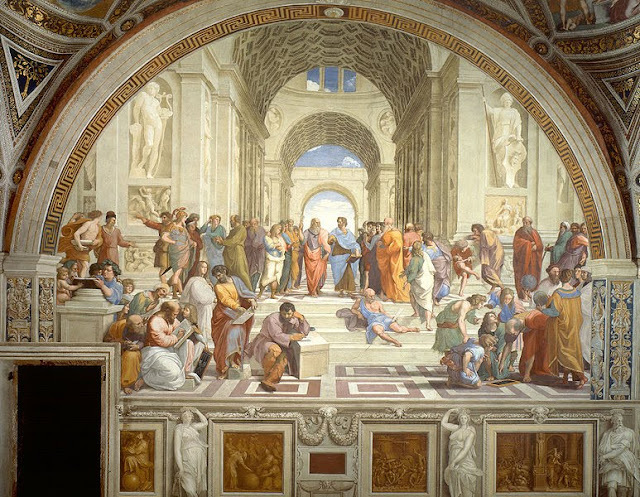 Art Scholars and Theologians have spent much time trying to pick this painting apart - trying to identify each character and muttering that not many are Athenians and that Plato and Aristotle aren't the best examples to have used for the Spiritual vs Science analogy. Like many miscreants intent on believing that deciphering Art leads to earth shattering conspiracies, their assumptions always drift into the misty world of speculation. There is a lovely article by Michael Lathanas here, examining the identities of known figures. 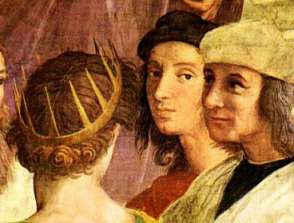 What Raphael is showing is his take on the great contributors to knowledge as perceived in his era. The portraits displayed within are not an exhaustive catalogue of the minds shaping the Papacy, and were never meant to have been. The characters that can be identified have been deliberately labelled, clutching onto a titled volume or displaying their theorem on a slate. We can merely guess at Raphael's level of education in Philosophy and History, but can most assuredly say that he was privy to the popular conception of the figures in question at the time of this image's creation. It should also come as no surprise that Raphael quite clearly demonstrated his pride and affinity for what these figures represent - painting himself into the image, and staring quite clearly at the viewer in a cameo of Ancient Greek painter Apelles of Kos. Raphael has continued to be an inspirational, yet controversial figure in art, including into the modern era. Many describe his work as 'too perfect' and clean, with an idealistic thoughtless quality. It was this sentiment which consumed the Pre-Raphaelite Brotherhood, who named their very movement after a period before they believe Raphael sanitised the Renaissance, removing the mystery of Leonardo's works and the angst and emotion of Michelangelo efforts. The Pre-Raphaelite Brotherhood (PRB) were disillusioned with the Royal Academy who espoused Raphael's work as an ideal. 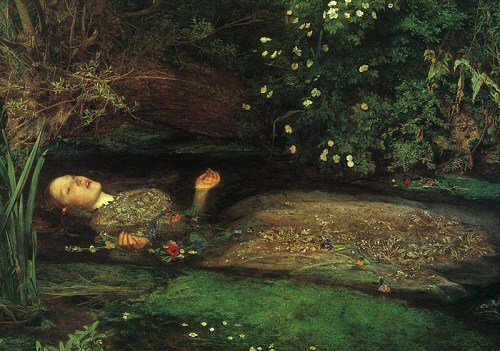 They saw this as stifling new innovation in art and preferred a more direct approach to emotion as demonstrated by Millais' dying Ophelia. It is interesting to note that as Millais aged, his works became increasingly sanitised themselves, with his painting 'Bubbles' eventually becoming a billboard for Pears Soap! 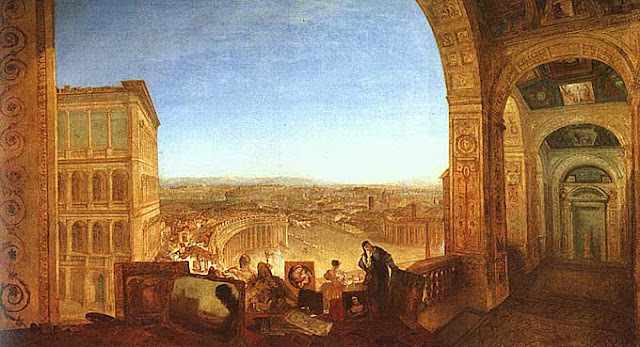 Prior to the PRB, English Romantic artist J.M.W Turner was quite enamoured with Raphael, going as far as to paint him into a view of Rome from the Vatican (1820). It is interesting to note the Loggia Corridor on the right, with Raphael himself as the central figure. For artists like Turner, and quite a few others, Raphael represented the pinnacle of technique and talent, brought about by the fusion of classical methods, with the humanist underpinnings of the Renaissance helping to usher the world into a more modern, enlightened era. 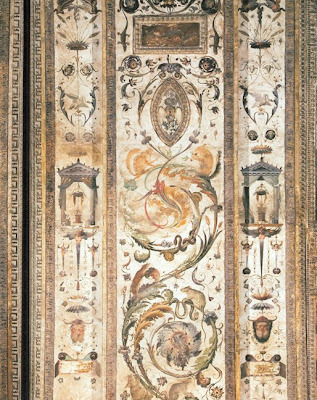 Turner presents a florid image of Rome, with Raphael and his antiquity inspired Loggia decorations as central themes. It would be unfair to say that Raphael's paintings were entirely devoid of intense emotion, or incapable of inciting them. 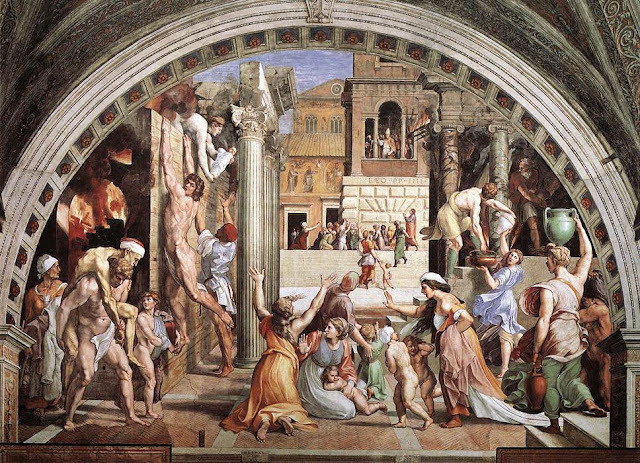 This is perfectly evidenced by The Fire in The Borgo(1514), painted in the same part of the Vatican as the School of Athens (now known as the Raphael Rooms). The painting depicts the fire of Borgo in Rome in 847 CE, which Pope Leo IV is celebrated to have quelled with words alone. The figures depicted in this painting are shown desperately fighting for their lives, trying to save others, or lamenting the dead. It was cited as a direct inspiration by Pablo Picasso in his highly politicised masterpiece, Guernica(1937). Described by many critics as "The Painting of the 20th Century", it is an example of modern techniques tackling the daunting subject of representing emotion via imagery.The image depicts the horrors of the aerial bombing of Basque region of Spain during the Spanish Civil War. In a time before the mass media explosion that pervades the world today, the painting successfully brought the attention of an international audience to the injustices being perpetrated by the Fascist Nationalist forces during the war. For those unfamiliar with the motifs of Picasso's work, understanding the emotion it contains is enhanced by learning a bit more about it. Melvin E Becraft's Guernica - Images within Images is available here as a free PDF download. It is an easy read and highly recommended as an introduction to this amazing image. 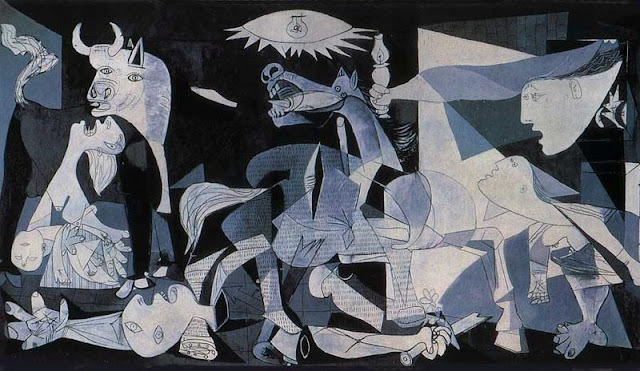 Guernica - people, buildings and animals are not spared from violence in this moving image. Raphael's Fire in The Borgo, particularly the section on the left with the woman passing the baby out of the window, and the despairing central figure were direct inspirations for Picasso's famous painting, created over 300 years later. Whether Raphael's striving for classical perfection gels with you or not, it is hard to argue against the fact that he had supreme technical ability as a painter. This ability, his positive outlook on learning from the past, and talent for adapting these lessons into innovations gave him a special place in the hearts and minds of scholars and creative artists alike. Despite not achieving full superstar status in the modern era, such as that enjoyed by Leonardo Da Vinci or Michelangelo, Raphael occupies an important space in the impressive catalogue of Italian Renaissance artists. One can only speculate at how his style would have evolved had he lived longer. 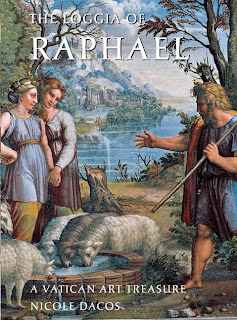 For a wonderfully illustrated guide encompassing all of Raphael's short but celebrated career, Pierluigi De Vecchi's Raphael(pub. 2002) is a must have. The stunning pictures contained within are the closest you can get to the Master from Urbino without visiting his works in person. La Donna Velata (c.1514-1515). 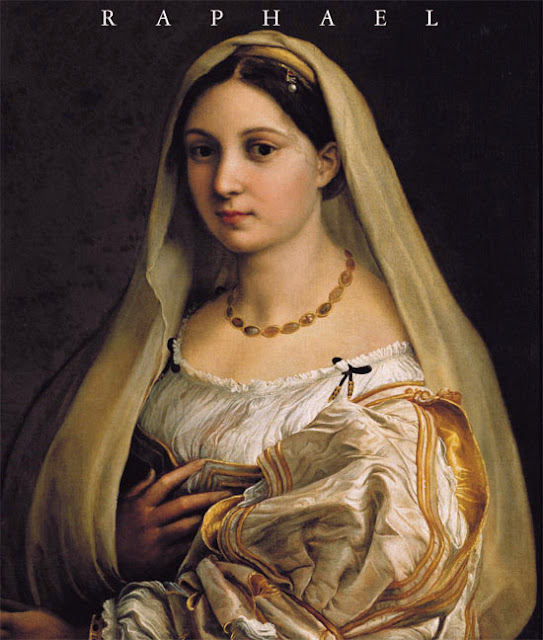 This veiled woman is believed to be Raphael's lover, Margerita Luti. this is fascinating! well-written and full of beautiful imagery and interesting history. thank you! Cheers Zoe! I am pleased you enjoyed reading it - I very much enjoyed writing it!